Looking for information about the characters in the movie Shrek? The popular DreamWorks movie features a large list of bolder-than-life characters that can sometimes be difficult to keep track of. Both children and adults alike enjoy the film for many of its jokes and hidden messages. From major players like the title character, Shrek, to smaller characters like Dragon, Shrek has partially become one of the most-loved movies of all times because of it's powerful characters and actors. 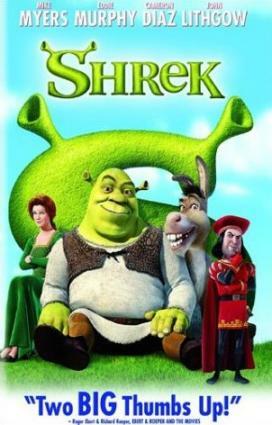 The movie features a simple plot: Ogre Shrek finds his swamp overrun with fairytale creatures after they are forced into his swampland by Lord Farquaad. Angered, Shrek travels to tell the Lord his displeasure with this. The Lord has issues himself: he need find a wife in order to become king. However, the princess he chooses is protected in a castle and must be rescued. The Lord agrees that if Shrek can rescue her on the Lord's behalf, Shrek's swamp will no longer be overrun with fairytale creatures. Along the way, Shrek travels with Donkey to rescue the princess. Once rescued, the two must work to return her safely. Over time, Shrek and Princess Fiona begin to fall in love with one another. Shrek becomes upset when Donkey highlights this fact and Shrek decides to keep his feelings secret. The Princess is too hiding a secret: due to a childhood curse, Fiona becomes an ogre every night. Only Fiona's true love can permanently restore her to her rightful form. The movie ends happily after a failed wedding between Fiona and Lord Farquaad with Fiona and Shrek married. In Shrek 2, the couple runs on to bigger problems, however. A giant green ogre, Shrek is the main role in the movie. Initially self-interested, Shrek falls in love with the princess he is returning to marry another man. Along the way, he shatters the princess' idealistic views of love and forces her to realize that looks mean nothing compared to compassion. With the help of his sidekick, Donkey, Shrek is able to marry Fiona and live happily ever after--or until Shrek 2. After being sent to Shrek's swamp for being a talking donkey, Donkey teams up with Shrek. The two initially look to get rid of the fairytale creatures at the swamp. Later, they rescue the princess. Donkey's smooth talking with the Dragon allows the two to acquire another assistant on their mission. He is also the initial secret-keeper for Fiona's transformative secret. Having spending most of her life locked up in castle waiting for her knight to save her, Fiona is a little put off by Shrek's appearance. She looks forward to meeting her true love, whom she believes Shrek is delivering her to. Her nightly transformation into an ogre is a cycle she's looking forward to breaking. Though she falls in love with Shrek, she knows she is meant to marry the Lord. After sharing a kiss with Shrek, she is transformed permanently into an ogre, realizing the true depths and meaning of love. Egotistical and meek, the Lord does not want to rescue his princess. Seeing an opportunity in Shrek, he sends him on the mission to rescue his princess. When she is returned, the Lord and Fiona are to be married. When Fiona turns into an ogre, the Lord rejects her and their marriage agreement. Gingy was made by the Muffin Man and thought he had it all. However, Lord Farquaad imprisons him and tortures him to find the location of fairytale creatures. In later Shrek movies, he has a much larger role. Dragon is guarding the castle that Fiona is trapped within. However, after being sweet talked by Donkey, Dragon becomes an ally of Shrek and rescues him from the final wedding scene. The characters in the movie Shrek are a variable cast of fun. Memorable and humorous, each character brings a certain element to the film.